This book provides dependable and thorough coverage of SQL Server Reporting Services (SRS). Pros: Most importantly, this book provides dependable and thorough coverage of SQL Server Reporting Services (SRS). There isn't much fluff in this book - but it reads incredibly well, and continuously delivers valuable content, page after page. 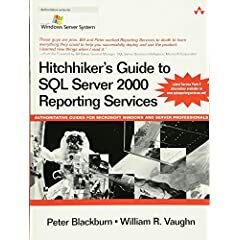 This book is a true triumph in technical writing - it provides excellent, insightful, information about SRS in a very approachable and practical way; and manages to not only provide a core understanding of the major concepts and principles surrounding SRS, but manages to provide exceptional insight into advanced topics, as well as SRS limitations and compensating techniques. A lot of thought and effort went into this book. It's a must have for anyone doing SRS (2000 or 2005). Cons: There really are no cons to this book. I wish, obviously, that it covered SRS 2005, but other than that, I can't think of any viable weakness of this book. Anyone doing SRS should just own this book. Period. Another great thing about this book is the flow and tone employed by the authors. There's know doubt that they did their research and know their stuff - but they don't come off as stuffy or unapproachable. One of my favorite things about this book is chapter 9 3/4 (that's right, chapter 9.75). What I love about it is that not only is it chock-full of excellent info, but it follows chapter 11. You might think that would be some sort of stunt, or gimmick - but the way the authors cover the reasoning behind this 'maneuver' and the way the information flows, this decision ends up feeling completely like second nature.